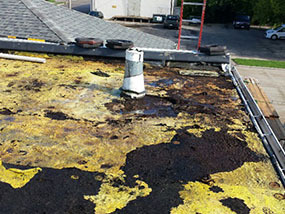 Flat roofs are commonly found on commercial buildings, and while they have their benefits they are also susceptible to certain problems. Regular inspections and proper maintenance go a long way in helping keep a roof in good shape, but at some point any flat roof will need replacement. When the time for flat roof replacement has come for your building, the expert crew at E&E Construction Company is here to get the job done properly and efficiently. If your commercial building is located in the Parkersburg, OH, area, give E&E Construction a call today, (740) 331-0695, to schedule a free consultation! Cost: Flat roofs are typically more budget friendly than their pitched roof counterparts. Accessibility: Flat roofs are much easier to walk on, making it more convenient (and usually less costly) to have a flat roof repaired, inspected and maintained. It is also easier to install and maintain equipment on a flat roof, such as solar panels and HVAC units. Functionality: Because of its lack of pitch and ease of access, a flat roof can be utilized as extra space in ways a pitched roof can’t be, like for housing storage facilities, rooftop decks and more. Ponding Water: Ponding water is precipitation that remains on a roof for 48 hours or longer without draining away properly. When this happens, roofing materials can begin to break down, and damage can accelerate. Because of their lack of pitch, flat roofs are prone to this type of problem. Buckling: When extreme amounts of snow or rain accumulate on a flat roof, that lack of pitch (which prevents the rain or snow from efficiently sliding off) can lead to a heavy weight on the roof, which can cause the roof to buckle. Leaking: Flat roofs are among the roof types that are particularly prone to developing leaks, and the leaks are often the result of inadequate drainage. 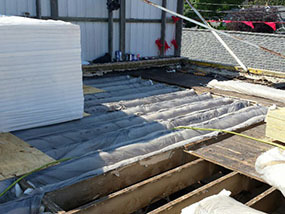 Leaks on a flat roof are most common along the roof seams. If flat roof problems are knocking at your door and it’s time for a roof replacement, you can count on the experts at E&E Construction Company to do the job right. Give us a call today at (740) 331-0695 to schedule a free consultation. One of our professional roofing technicians will visit your building and thoroughly inspect your roof to assess its condition. We will then give you the best options to fit your needs and budget. You can count on the team at E&E Construction!